materfamilias writes: What to Wear When Walking to the Ballet . . . Comfortable Pizzaz? What to Wear When Walking to the Ballet . . . Comfortable Pizzaz? First of all, thanks so much for your kind and encouraging comments on my last post. It's always awkward to write something like that because I don't want to be seen as fishing, as trying to elicit praise. But sometimes the only way to keep writing is to write about the blocks, about what's making it tough for me to engage with the words, on the screen. That's what I was doing yesterday morning, and now I'm heartened and embarrassed in just about equal measures by all your positive feedback about what you find here. It seems that random and uneven is okay with you. In fact, it seems that -- despite our reservations about the word "authentic"-- you see the random and uneven as worthwhile because they reflect a certain authenticity. Apparently "random and uneven" work, occasionally at least, because they echo something others experience. Thank you for telling me this, so warmly. To those who suggested I post less often -- once a week, perhaps. . . this is an excellent and sensible suggestion, and I have no idea why it isn't the solution I'm trying. Except that it feels a bit too much like putting too many eggs in one basket, or something like that. At the moment, feeling a bit scattered, I'm actually feeling I might post more often one week -- a series of short posts, perhaps mostly visual -- and less the next, perhaps a longer "thought piece." So today, I give you a What I Wore post. Last Friday, we spontaneously bought tickets for BC Ballet's performance that evening (and what a gorgeous show that was, contemporary dance drawing on all the beauty and discipline of classical ballet -- responding to a range of music from Jimi Hendrix to Mozart to Dutch composer Thom Willems). And since we were walking downtown (about 3 kilometres each way), comfortable footwear was important, but I wanted a bit of pizzaz. . . 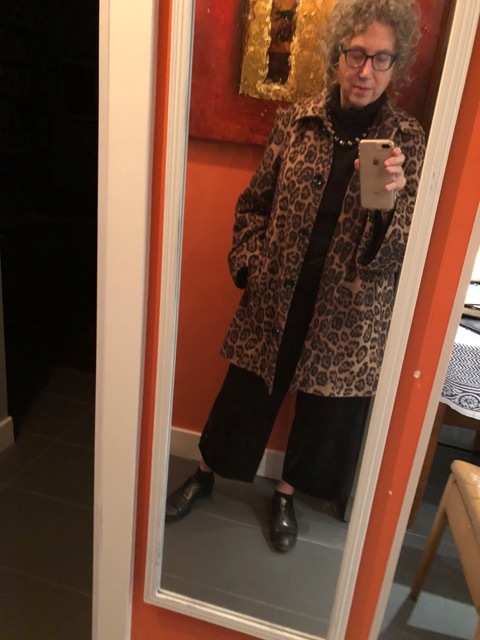 So my MOMA Oxfords, with their metallic finish, and my leopard-print wool coat (9 years old now, by Canadian label Louben). Worn over black Vince sweater (cashmere against the chilly night -- a gamble inside the theatre, though, and I might have used my program as fan once or twice) and black wide-legged, cropped knit pants (wool) by Aritzia -- the only new garment in the outfit and already a wardrobe favourite. Those beads you've seen before and my Hermès watch with its non-Hermès (but bought in Paris, as you can see in this sketch) strap. .
And that's all for today. . .
except to thank you again for being here . . . Yes, theaters--you never know whether you will shiver or sweat. Layers are important. The dance performance sounds fantastic. Thank you! And yes, it was a fantastic performance -- made us wonder why we haven't been watching more dance. Aha! A post...I was not expecting but am very happy to see it. That gorgeous Louben coat and those wonderful wide leg Aritzia pants will be wardrobe workhorses. I visited a former Goward House bridge player who is now in a seniors facility, she's 84 and I wore my Black Goat long sleeved cashmere sweater...HUGE mistake as the heating in those senior care facilities is HOT!!! I nearly melyed but we had a nice visit in spite of my wardrobe mistake. ONce a week posts may be your solution to writers block. Perfect and full of Pazazz! Love the cropped trousers and the boots . Perfect and no doubt very comfortable. Thanks very much B! And yes, the trousers are as comfy as pyjamas! That's a comfortable artistic looking outfit! That coat could go over any combination and be great. I'm glad you're still posting. Your coat proves that some things never go out of style. As for the heat in theatres, I remember going to see Phantom of the Opera on the London stage years ago where it was so warm, I actually fell asleep. Lesson learned: try not to see a theatre production right after an overseas journey or jet lag and too much warmth might conspire against you. Ha! Especially with jet lag, I can imagine that drift into sleep, despite the excitement onstage. 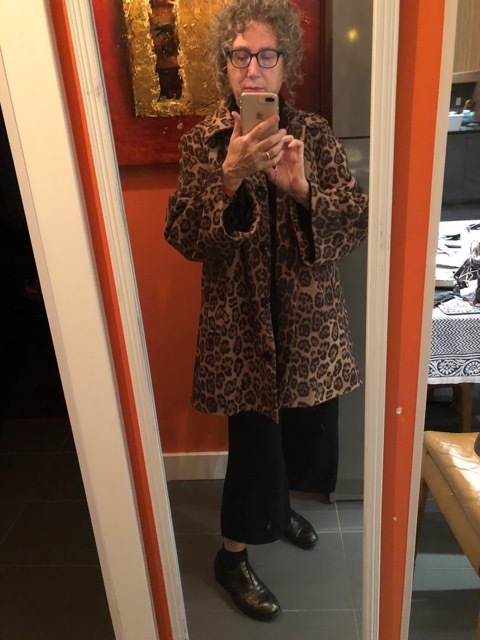 . .
Love leopard print and your coat! I love that I can know picture exactly the theatre you're speaking of -- I have such a wonderful memory of the Beethoven we heard there. . .
That looks really good . I’ve very mixed feelings about leopard prints & generally prefer them on leopards . I have a leopard print top in greens & a couple of scarves in other colourways but the regular leopard worn in a ‘ glitzy ‘ way with lots of gold jewelry etc is really not my style . You’ve given it your usual bohemian twist & it works . Isn’t it great in this disposable world to pull out something you’ve had for ages & still love it . On leopards and then on Elizabeth Taylor, right? (She's the image I get at your "glitzy" description. Thank you for writing that I have a "usual bohemian twist" -- I love it!! And yes, it's such a confirmation of values, for one thing, to still love something I chose nine years ago, never mind so much better for the planet. 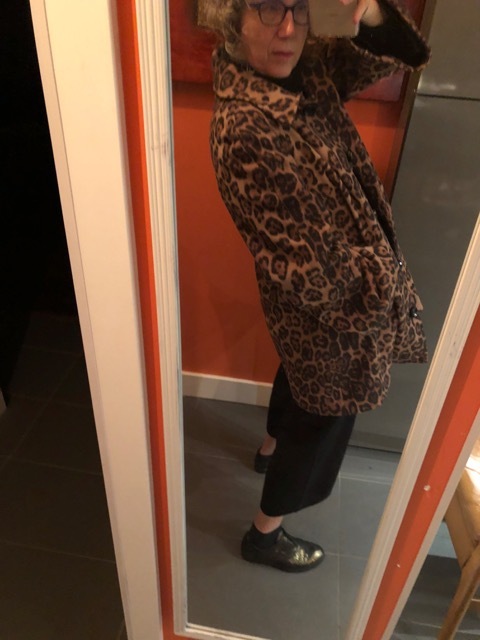 I've been missing a bit o leopard recently, missing an old trench with would admittedly be about 3 sizes too big now. 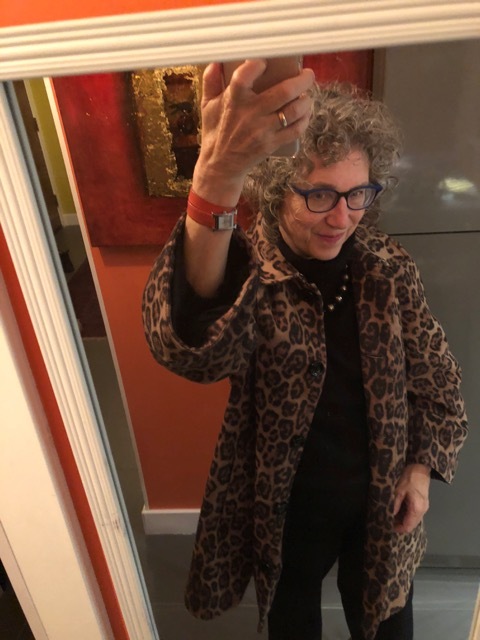 I love the way you make your WIW posts about the life lived, and the outfit is just the icing. There you are!! You ran the cyber-gauntlet and got through to post here again. I've missed your comments! Thanks for your appreciation of my putting an outfit in context; it's an important feature, to me. I love this look so much. You look cool, chic and comfortable. I want to copy it best I can for the opera tomorrow. Sadly, no leopard coat unless I find one today! I was thrilled to see this post but please do what feels right for you. I will follow no matter what you decide. The last two photos of you in the post are my all time favorite of you: a slice of insouciance, a bit of cheek and a wry smile. Simply put, you look fab. I just spit my ginger tea out in a snorting laugh over Wendy's comment of leopard print being best on leopards. We are all different and isn't that tbe beauty of it? I am leopard- loving right down to my pjs and bras and for decades....long may leopard print last. I wear it in all forms when it is in and when it is out-who cares. It speaks to me, and about me. That coat looks incredible on you...especially with the beads you are wearing. Rock on, Frances-the last thing you look like is a typical nana. Travel safely and enjoy your winter in London -- what a place to be! Wow I LOVE that outfit! Such panache. You look fabulous (yes to the word panache), and those trousers look wonderful and comfie.